On Saturday I joined the Wellington Botanical Society’s field trip to Wright Hill in Karori, Wellington. Wellington city would not be my first choice of locality for fern spotting, but we still found plenty to keep me interested. 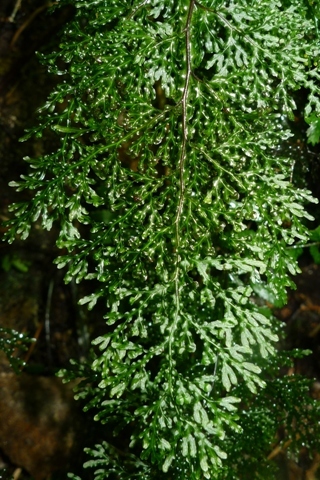 The striking filmy fern Hymenophyllum flexuosum. The scientific name means wavy or undulating (flexuose) membranous (hymen) leaf (phyllum). The fronds of most filmy ferns are only one cell thick! Hymenophyllum flexuosum usually grows on rocks, but can be a low epiphyte on trees. Photo © Leon Perrie. The filmy ferns Hymenophyllum flexuosum and Trichomanes endlicherianum are always pleasing finds. Although widespread, they are not common (but not so rare to be on the national Threatened or At Risk lists). We found them together on a shaded rock face. Rock outcrops are always worth a close inspection because they can be home to species not found in other nearby habitats. Trichomanes endlicherianum. Note the tubular reproductive structures that characterise the genus. 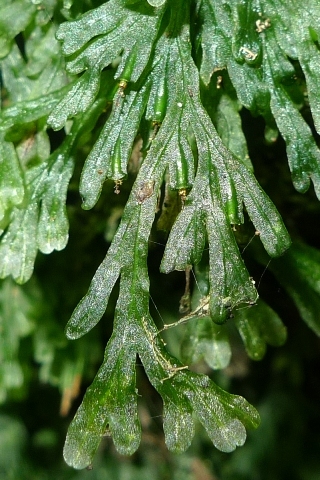 By contrast, the reproductive structures in Hymenophyllum are each enclosed by two distinct flaps. Trichomanes endlicherianum is almost always found on shaded, near-vertical rock faces. It occasionally grows on trees, particularly at the bases of nikau palms. 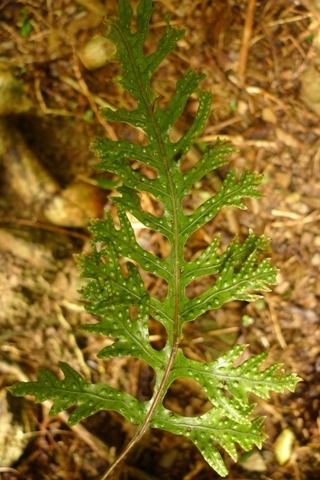 The similar Trichomanes venosum commonly grows on the trunks of tree ferns, but is easily distinguished on account of having multiple veins in each segment of the frond. Photo © Leon Perrie. The shield fern Polystichum silvaticum was also an interesting find. I spotted this less than half an hour after I had predicted we wouldn’t find it because I thought the environment was not wet or cold enough (and I had forgotten that I had previously collected it from nearby Makara about six years ago). Its presence says something about Karori’s climate. The shield-less shield fern Polystichum silvaticum. Photo © Leon Perrie. 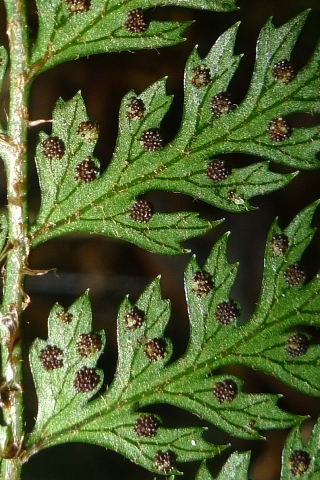 The reproductive structures of Polystichum silvaticum are naked, lacking the shield-like protective coverings that characterise its relatives. Photo © Leon Perrie. But my day’s highlight was finding a hybrid between Polystichum neozelandicum and P. silvaticum, which is the first time this has ever been recorded. Some Polystichum hybrid combinations are quite common, particularly, P. neozelandicum × P. vestitum. However, P. neozelandicum and P. silvaticum rarely grow in close proximity, limiting the likelihood of their hybridisation. 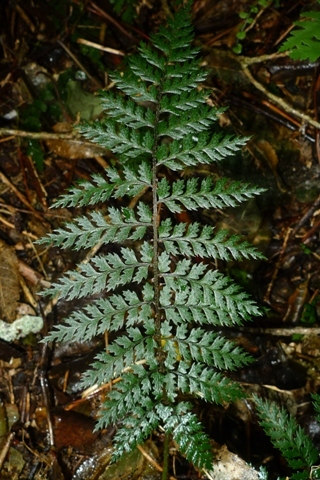 First record of the hybrid between Polystichum neozelandicum and P. silvaticum. Photo © Leon Perrie. We also spotted a monstrous form of hound’s tongue fern, Microsorum pustulatum. These are due to damage to the growing bud, such that it produces fronds that divide more than is typical. During the nineteenth-century ‘fern craze’, such abnormalities were highly prized (and financially-valued) by collectors. Hound’s tongue fern seems particularly predisposed to monstrosities: in the last year I have seen similar plants near Eastbourne and in the Waioeka Gorge, but only at low frequencies (c. 1%). A so-called monstrous or crested frond of hound’s tongue fern, Microsorum pustulatum. The lobes of the fronds of hound’s tongue fern do not normally fork at their apices. Photo © Leon Perrie. 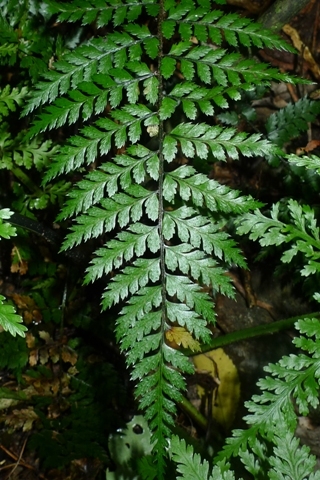 Learn more about hound’s tongue fern on the Common New Zealand Ferns webpages.